Dr Smith was lead author of the Best Practice Guidance for Habitat Survey and Mapping published by the Heritage Council. The Guidance is designed for use by those commissioning and those carrying out habitat survey and mapping at a range of scales from wide landscape to small site scales. The Best Practice Guidance forms the companion volume to A Guide to Habitats in Ireland (Fossitt, 2000), which is the primary habitat classification system used in Ireland. The Guidance begins with an introduction to the ecological issues involved in habitat classification at various scales and an introduction to mapping, GIS, use of GPS and metadata. Advice on planning and managing habitat surveys is provided, and the stages of a well-executed habitat survey are outlined. The Best Practice Guidance follows with recommendations on planning field surveys and data management. Desktop review of existing ecological datasets and non-digital information and the importance of consultations with knowledgeable bodies and landowners are discussed. Detailed guidance on field survey and mapping forms the central section of the book. Detailed guidelines on producing and managing GIS datasets, maps, quality assurance and metadata are also provided. 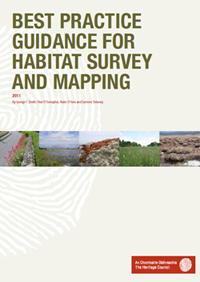 The Guidance concludes with an overview of the uses to which habitat survey and mapping data can be put and other ecological surveys that can be carried out to build on habitat survey data. The Best Practice Guidance has reviewed by a number of experts in habitat survey and GIS. 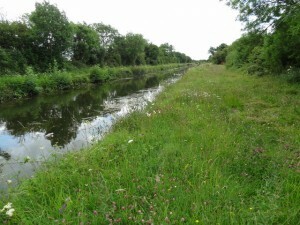 In 2014, Blackthorn Ecology carried out an extensive ecological survey of four sections of canal: the Grand Canal Barrow Line (48.8 km), part of the Royal Canal in and around Mullingar (8.1 km), the Lough Owel Feeder (3.6 km), and the Edenderry Branch (1.6 km). We mapped in the field all aquatic, wetland and terrestrial habitats along the canals and towpaths according to the Heritage Council habitat classification scheme (Fossitt, 2000) and the Habitats Directive system. A comprehensive inventory was compiled of aquatic and terrestrial plant species and all birds recorded within each of 45 sections of canal, as defined by bridges, locks and aqueducts. All signs of mammals, including potential setts and holts, were recorded, with special attention paid to protected species. Invasive species locations were marked with GPS, as were management features, such as access points and water discharges or abstractions. Ecologically Sensitive Areas were highlighted for special attention by future management. Survey results and recommendations were summarised in a detailed report, maps, georeferenced photograph archive and a GIS database. 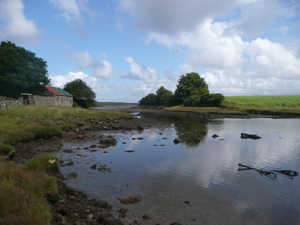 In 2011-2012, Blackthorn Ecology carried out the natural heritage component of a multidisciplinary heritage audit of the lower River Nore in collaboration with Kilkenny Archaeology. 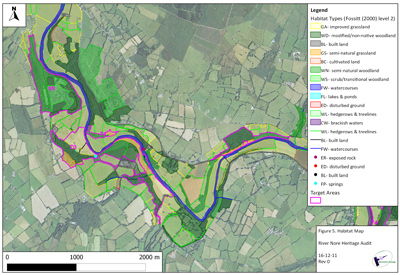 We surveyed the river corridor and adjacent habitats along the 44 km stretch of the river from Kilkenny City to its confluence with the River Barrow. Surveys were informed by initial desk studies and consultations so that the most ecologically important habitats and species could be targeted in the field. Field surveys were carried out on foot and also by boat. Habitats were mapped according to the Heritage Council and EU Habitats Directive classification schemes, in addition to more detailed and specialist classification schemes. Flora and fauna were recorded and significant populations were recorded using GPS and GPS-enabled digital photography. Blackthorn Ecology paid particular attention to recording populations of endangered species, such as autumn crocus, and invasive non-natives, such as Himalayan balsam. Desk and field survey results were used to compile a GIS database and maps of habitats, significant natural heritage areas, and Green Infrastructure. Green Infrastructure mapping included important habitats for floodwater retention, carbon sequestration and recreation. The maps and GIS database will be used for strategic planning, and the TrailKilkenny Project has already made use of this information for heritage tourism interpretation. In 2012, Blackthorn Ecology completed a detailed habitat and botanical survey of a section of the River Dodder valley and Kiltipper Park. Habitats were classified and mapped following the Heritage Council classification scheme. A GIS database was compiled recording identity, location, extent and nature conservation value of habitats and plant species in the study area. 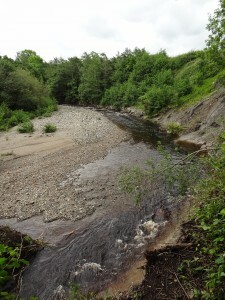 The study concluded that the River Dodder and surrounding semi-natural habitats form an important ecological corridor linking the Glenasmole Valley upstream with the downstream sections of the Dodder valley and onward to Dublin Bay. In the suburban parts of the study area, however, the ecological corridor was narrow, being limited to the river itself and a narrow band of trees on the riverbanks. Ecological connectivity to the Dublin Mountains to the east and west was minimal because of the presence of roads and poor quality of hedgerows. We provided recommendations on the development of a Dodder Valley Linear Park and on enhancing ecological connectivity within local wildlife habitats and to the Dublin Mountains. Dr Smith was the project manager and lead ecologist for a tree, woodland and significant hedgerow survey for County Meath in 2010. The survey provided baseline ecological data, including identification and mapping of type, extent and condition, for selected woodlands, parklands and hedgerows in Meath. The study area included all of County Meath and combined desktop and field-based approaches to maximise the quality of information provided to the County Council. Extensive hedgerow field surveys were carried out using Murray and Foulkes’s (2006) methodology to ensure comparability with surveys carried out in neighbouring counties. Following the field survey, Dr Smith analysed hedgerow data using multivariate statistics, and the results were used to provide an overview of the condition and management of Meath hedgerows. 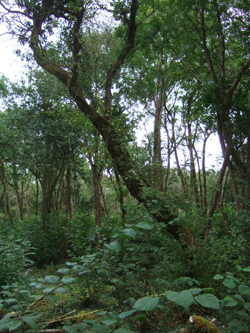 The woodland, tree and parkland component of the survey was approached by assembling existing spatial datasets, including the NPWS National Survey of Native Woodlands (NSNW), the Forest Service database, the National Inventory of Architectural Heritage (for parklands), the Tree Register of Ireland and Coillte inventory data. Consultations with state bodies, local foresters and ecologists, and forest and estate landowners were a central part of the project. As the NSNW had already surveyed native woodlands of national conservation value, field surveys concentrated on parcels of woodland of local or county interest not previously surveyed. The field surveys also focused on parklands and non-native estate woodlands, many of which were found to be of at least county-scale importance for natural heritage. A GIS database of woodlands, parklands, trees and hedgerows was prepared for the Council to support strategic biodiversity planning and management. Recommendations for managing Meath’s hedgerows and woodlands were included in the final report. 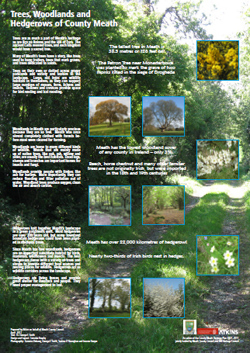 The project also produced a booklet and a poster to promote public awareness and good management of Meath’s tree, woodland and hedgerow resource. 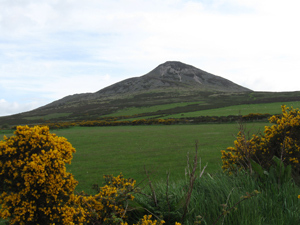 Dr Smith was project manager and lead ecologist for an assessment of the Great and Little Sugar Loaf Mountains in northeast Co. Wicklow to support a proposed Special Amenity Area Order by Wicklow County Council. The assessment included desktop and field-based surveys of the geology, landscape character, ecology and cultural heritage of the site. In addition, recreational use of the Sugar Loafs was evaluated, constraints and threats arising from recreational use were identified, and the potential for enhancing recreation amenity was evaluated. This aspect of the study involved detailed consultations with land owners, including the Kilruddery Estate, and recreational users, such as hill walkers, horse riders and paragliders. Core Area and Buffer Area boundaries were proposed for the Special Amenity Area based on the landscape and heritage value of the site. A final report and maps of proposed boundaries, geology, landscape character, habitats, and cultural heritage were produced. Habitats were mapped using GIS, first on a preliminary basis using aerial photography and subsequently in the field, and classified according to level III of Fossitt (2000). Dr Smith was the project manager and lead ecologist for a series of ecological surveys of three designated areas for the North Midlands Region of the National Parks and Wildlife Service: St. John’s Wood, Co. Roscommon in Lough Ree Special Area of Conservation, Annagh Lough Natural Heritage Area, and Ballynafid Lake Natural Heritage Area. 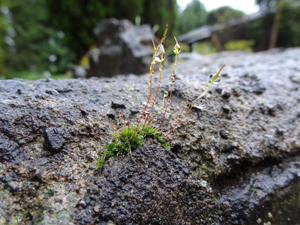 The surveys included walkover plant species recording, vascular plant and bryophyte recording in quadrats, woodland structural analyses and habitat mapping of woodlands, lake and marginal wetlands. In St. John’s Wood, notable individual trees were surveyed in detail, mapped using GPS, and tagged. The survey results were analysed quantitatively to assess the effects of current and past management on biodiversity. Management recommendations were made in relation to woodland coppicing, control of Rhododendron and other invasive plants, potential impacts of visitor access on a rare plant species (Pyrola rotundifolia) and future monitoring.